From see-through pod tents to the last word in luxury, Australia has plenty of choice when it comes to unique places to stay. Bubble Tent Australia, located in Capertee Valley, just under three hours’ drive from Sydney. Located in the spectacular Capertee Valley (considered by many to be Australia’s Grand Canyon), just under three hours’ drive from Sydney, Bubble Tent Australia’s three off-the-grid see-through pods come with en suites, fire pits and telescopes for star-gazing. Between Brisbane and the Gold Coast (almost exactly in the middle at a 30-minute drive), Sanctuary by Sirromet has 18 luxury canvas tents set up among the vines of this family-owned winery. Roar and Snore at Sydney’s Taronga Zoo is the ultimate inner-city wildlife encounter, with guests heading out after-dark to tour the zoo and waking up to the sound of roaring lions and views of Sydney Harbour. Sitting in the heart of Western Australia’s rugged and expansive Karijini National Park, the award-winning Karijini Eco Retreat runs in collaboration with traditional Indigenous owners and includes 40 deluxe eco tents. Located on Hamilton Island in Queensland’s gorgeous Whitsundays, qualia, a member of Luxury Lodges of Australia, consistently ranks as one of Australia’s most luxurious resorts, offering up impeccable service and a truly dazzling location on the Great Barrier Reef. Just over three hours’ drive from Sydney in the Greater Blue Mountains, Emirates One&Only Wolgan Valley – also a member of Luxury Lodges of Australia – is nestled in a spectacular valley surrounded by towering red-rock escarpments and teeming with wildlife including an elusive albino wallaroo. Each luxurious self-contained lodge comes with its own plunge pool. Jackalope’s deck by sunset, Mornington Peninsula. Image via Sharyn Cairns. Named the Best Hotel in Australia and New Zealand in 2018 by Condé Nast Traveler readers, COMO The Treasury in the heart of Perth has 48 rooms and suites, a spa and an indoor pool within a historic grand façade. A giant black sculpture at the entrance of Jackalope leaves you in no doubt that the place is something special. Inside the gorgeous Halcyon House, Cabarita Beach. Melbourne. Its premium Lair rooms include daily luxuries such as Champagne and oysters and massage treatments. Art Series Hotels’ collection of seven hotels are each dedicated to an Australian artist, from The Olsen, located in Melbourne’s South Yarra and featuring the works of John Olsen, a living legend, to The Johnson in Brisbane’s Spring Hill, dedicated to abstract artist Michael Johnson. Halcyon House, a must-visit boutique hotel on the northern NSW coast. Having started life as a motel, Halcyon House in the sleepy town of Cabarita Beach on the New South Wales far north coast (just 20 minutes from Gold Coast Airport) got a spectacular makeover at the hands of Brisbane-based designer Anna Spiro to be reinvented as a breezy luxury hotel. 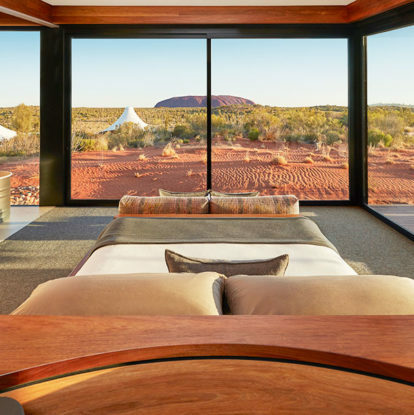 The jaw-dropping Dune Pavillion Bedroom of Longitude 131° overlooking Uluru. Views don’t come more awe-inspiring than those at Longitude 131° (another member of Luxury Lodges of Australia), sitting as it does within the World Heritage-listed Uluru-Kata Tjuta National Park, with uninterrupted views across the red dirt and low desert scrub to Uluru in all its glory. Each of the 16 tented pavilions is ultra-luxurious and reflective of the location, while the service and food are world-class. The stunning cliff side Coastal Pavillions of Freycinet Lodge, Tasmania. Image via Alastair Bett. of the 15 luxury eco tents looks out to the pristine Ningaloo Reef, home to over 500 species of fish, 250 coral species, and the gentle giant that is the whale shark. Located in Freycinet National Park on Tasmania’s rugged east coast, Freycinet Lodge’s Coastal Pavilions are a collection of nine architecturally designed wood and glass structures that cocoon guests in luxury within a pristine coastal bush setting. Experience elegance in modern suites with a touch of Australian luxury and perfect views, all framed in floor-to-ceiling glass windows that open on to private balconies. Includes round-the-clock butler service and return limousine transfers. Experience a conservation retreat of natural wonders and supreme privacy in Australia’s Greater Blue Mountains. Includes luxury villa with private pool, daily gourmet meals and complimentary wildlife tour.